Dental hygienists work in interprofessional collaborative environments. They are accountable to codes of ethics, in conjunction with professional standards, workplace policies, and laws and regulations that guide practices and behaviours. In achieving these requirements, they fulfill their contract with society to meet a high standard of ethical practice. Read the report describing the development of the Code of Ethics. The CDHA Code of Ethics sets out the ethical principles and responsibilities which apply to all members of the dental hygiene profession across all practice areas including clinical care, education, research, administration and any other role related to the profession of dental hygiene. In addition, the Ethical Guidelines for Educators helps educators to make professional decisions. It is grounded in 6 ethical principles and provides a framework of shared values. Do you have any personal biases against the recreational or medicinal use of cannabis that would interfere with your professional responsibilities? Our life experiences and worldview inform our opinions and create bias. Yet, as regulated oral health care professionals, our obligation is to provide relevant, objective information from credible sources when communicating with clients, groups, and communities. We must always seek out appropriate, professional resources to acquire new knowledge and enhance our health promotion efforts. Part 2 is a complement to Part 1: Ethical Responsibilities of Online Instructors, which was published in the Summer 2018 issue (pages 45–46). It must be emphasized that ethical responsibilities are intertwined and each affects the other in an online learning environment: the classroom, the educational institution, the instructor, and the student. For example, in Part 1 various aspects of privacy breaches, confidentiality, access, and cultural sensitivity were discussed. All parties are affected and all parties are part of the solution. The intent of this contribution is to discuss briefly, and by no means fully, the ethical responsibilities of instructors and students in the online education classroom context. Part 1 introduces the ethical obligations of instructors teaching online; Part 2 in the Fall/Winter issue will explore the same subject as it pertains to online students. During our dental hygiene studies we were meticulous about assessing the submandibular, submental, and occipital lymph nodes. We palpated on either side of the sternocleidomastoid muscle and felt the differences to the temporalis and masseter muscles, and we assessed the temporomandibular joints while asking the client to open and close. There are many questions that the dental hygienist should consider when exposing clients to radiation. When a radiograph is prescribed, the dental hygienist must understand why the radiograph is necessary, how many radiographs are required, how much exposure to radiation the client will receive, and if the client has received radiation exposure recently from other medical procedures. On August 5, 2016, the federal Controlled Drugs and Substances Act was amended to include the Access to Cannabis for Medical Purposes Regulation (SOR/2016- 230) (ACMPR).1 The process documented in the ACMPR is more transparent, and patients are now able to legally obtain, use, and carry cannabis for medical purposes after registering with Health Canada. Dental hygienists play a vital role in protecting and promoting the health of individuals, communities, and populations. As regulated health professionals practisingin variety of settings, dental hygienists encounter ethical challenges when faced with situations requiring a balance of opposing values, beliefs, and obligations. We accept that, as self-regulated professionals, dental hygienists are obligated to provide for the well-being of their clients and society as a whole. Using the Process of Care model (Figure 1) in this situation is a systematic way to determine your next step. The Dental Hygienists’ Code of Ethics states that a dental hygienist’s primary responsibility is “to the client.” Furthermore, dental hygienists are bound to conduct themselves in accordance with applicable laws and guidelines, and are mandated to report non-compliance that they may witness. Oral cancer changes a person’s life. The impact of an oral cancer diagnosis on the individual, their family, friends, and community is significant. Yet cancer survival rates are improving, thanks to early detection, improved access to care, and recent enhancements in treatment protocols.1 Dental hygienists, as primary care providers or practitioners in health care, provide dental hygiene care according to our regulatory body, scope of practice, and code of ethics. The term “social media” (also known as Web 2.0) describes Internet-based technologies that allow users to interact and collaborate with others online. These applications include Facebook, Twitter, YouTube, etc. With this interactivity, social media is viewed as the interface of new technology and social communication to create (or co-create) new knowledge.1 Social media is a wonderful tool for the dissemination of health information, as well as for engaging professionals to connect, communicate, and share resources in various platforms. As health care providers we have a duty to ensure that we are giving our clients the best possible advice based on the best possible evidence. Yet what is our role when an emerging trend gains rapid popularity in the absence of sufficient high-quality evidence of safety and long-term consequences? We have all noticed advertisements offering free teeth whitening to new clients. It seems harmless enough and a tempting inducement to attract new clients. However, such incentives may not be ethically sound or adhere to your college regulatory guidelines with respect to advertising. One of your close friends is having difficulty completing her continuing competency requirements for her regulatory college. The deadline to submit proof of completion of professional development activities is looming. Your friend knows that you have successfully completed an online course that she is currently enrolled in but does not have the time to complete on her own. She asks you to sign into the exam under her ID and complete the exam for her. She promises to learn all of the material once her life circumstances change. The public expects their health care professionals to collaborate and put their interests first. 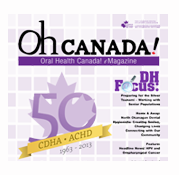 For more than fifty years, Canadian dental hygienists have provided ethical care to their clients within a cooperative team-oriented framework. With the evolution of the profession and recognition by provincial governments to legislate self-regulation, dental hygienists are obligated to accept more responsibilities on behalf of the public. 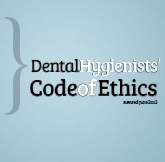 CDHA’s Dental Hygienists’ Code of Ethics, revised June 2012 is the cornerstone of dental hygienists’ commitment to ethics. It sets down ethical principles and responsibilities for the dental hygiene profession. It also helps define accepted behaviours, promotes high standards of practice, provides a benchmark for members to use in self evaluation, and establishes a framework for professional behaviour and responsibilities. All CDHA members are required to understand and comply with the code and follow its guidelines in their practice. I once made a conscious thought to keep track of how many times I lied in one day. I included those times when I stretched the truth, and told what is commonly called “white lies”. The number was staggering. In 2002, CDHA developed a Code of Ethics that serves as a foundation for ethical practice in dental hygiene. This document sets down the ethical principles and ethical practice standards of the dental hygiene profession. Clients, colleagues, and the public expect dental hygienists to be guided by, and to be accountable under, the principles articulated in this Code. Although the primary users of the Code of Ethics are CDHA members who are employed in a variety of practice settings, some dental hygiene regulatory authorities and provincial associations adopt the CDHA Code of Ethics as their provincial Code of Ethics. Dental hygienists are accountable to other codes of ethics/ethical guidelines including those of their provincial regulatory authority and their work place.